"Teapot Dome" redirects here. For other uses, see Teapot Dome (disambiguation). Before the Watergate scandal, Teapot Dome was regarded as the "greatest and most sensational scandal in the history of American politics". It damaged the reputation of the Harding administration, which was already severely diminished by its controversial handling of the Great Railroad Strike of 1922 and Harding's veto of the Bonus Bill in 1922. Congress subsequently passed legislation, enduring to this day, giving subpœna power to House and Senate for review of tax records of any US citizen without regard to elected or appointed position, nor subject to White House interference. In the early 20th century, the U.S. Navy largely converted from coal to fuel oil. To ensure that the Navy would always have enough fuel available, several oil-producing areas were designated as naval oil reserves by President Taft. In 1921, President Harding issued an executive order that transferred control of Teapot Dome Oil Field in Natrona County, Wyoming, and the Elk Hills and Buena Vista Oil Fields in Kern County, California, from the Navy Department to the Department of the Interior. This was not implemented until 1922, when Interior Secretary Fall persuaded Navy Secretary Edwin C. Denby to transfer control. Later in 1922, Interior Secretary Albert Fall leased the oil production rights at Teapot Dome to Harry F. Sinclair of Mammoth Oil, a subsidiary of Sinclair Oil Corporation. He also leased the Elk Hills reserve to Edward L. Doheny of Pan American Petroleum and Transport Company. Both leases were issued without competitive bidding. This manner of leasing was legal under the Mineral Leasing Act of 1920. The lease terms were very favorable to the oil companies, which secretly made Fall a rich man. Fall had received a no-interest loan from Doheny of $100,000 (about $1.4 million today) in November 1921. He received other gifts from Doheny and Sinclair totaling about $404,000 (about $5.67 million today). This money changing hands was illegal, not the leases. Fall attempted to keep his actions secret, but the sudden improvement in his standard of living was suspect. In April 1922, a Wyoming oil operator wrote to his Senator, John B. Kendrick, angered that Sinclair had been given a contract to the lands in a secret deal. Kendrick did not respond, but two days later on April 15, he introduced a resolution calling for an investigation of the deal. Republican Senator Robert M. La Follette Sr. of Wisconsin led an investigation by the Senate Committee on Public Lands. At first, La Follette believed Fall was innocent. However, his suspicions were aroused after his own office in the Senate Office Building was ransacked. Albert B. Fall was the first U.S. cabinet official sentenced to prison. Democrat Thomas J. Walsh of Montana, the most junior minority member, led a lengthy inquiry. For two years, Walsh pushed forward while Fall stepped backward, covering his tracks as he went. No evidence of wrongdoing was initially uncovered, as the leases were legal enough, but records kept disappearing mysteriously. Fall had made the leases appear legitimate, but his acceptance of the money was his undoing. By 1924, the remaining unanswered question was how Fall had become so rich so quickly and easily. Money from the bribes had gone to Fall's cattle ranch and investments in his business. Finally, as the investigation was winding down with Fall apparently innocent, Walsh uncovered a piece of evidence Fall had failed to cover up: Doheny's $100,000 loan to Fall. This discovery broke open the scandal. Civil and criminal suits related to the scandal continued throughout the 1920s. In 1927, the Supreme Court ruled that the oil leases had been corruptly obtained. 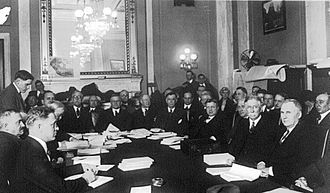 The Court invalidated the Elk Hills lease in February 1927, and the Teapot Dome lease in October. Both reserves were returned to the Navy. In 1929, Fall was found guilty of accepting bribes from Doheny. Conversely, in 1930, Doheny was acquitted of paying bribes to Fall. Further, Doheny's corporation foreclosed on Fall's home in Tularosa Basin, New Mexico, because of "unpaid loans" that turned out to be that same $100,000 bribe. Sinclair served six months in jail on a charge of jury tampering. Although Fall was to blame for this scandal, Harding's reputation was sullied because of his involvement with the wrong people. Evidence proving Fall's guilt only arose after Harding's death in 1923. The oil field was then idled for 49 years, but went back into production in 1976. After earning over $569 million in revenue having extracted 22 million barrels (3,500,000 m3) of oil over the previous 39 years, in February 2015, the Department of Energy sold the oil field for $45 million to Standard Oil Resources Corp. The Teapot Dome scandal has historically been regarded as the worst such scandal in the United States - the "high water mark" of cabinet corruption. It is often used as a benchmark for comparison with subsequent scandals. In particular it has been compared to the Watergate scandal, in which a cabinet member, Attorney General John N. Mitchell, went to prison for only the second time in American history. During the Trump administration news outlets compared alleged misconduct by members of the Trump cabinet, and specifically by Secretary of the Interior Ryan Zinke to the Teapot Dome scandal. ^ Cherny, Robert W. "Graft and Oil: How Teapot Dome Became the Greatest Political Scandal of its Time". History Now. Gilder Lehrman Institute of American History. Archived from the original on July 9, 2010. Retrieved May 27, 2010. ^ "Warren G Harding: Domestic & foreign affairs", Grant-Eisenhower, President profiles . ^ Paletta, Damian (9 April 2019). "Mnuchin reveals White House lawyers consulted Treasury on Trump tax returns, despite law meant to limit political involvement". The Washington Post. Retrieved 9 April 2019. ^ "Mineral Leasing Act of 1920 as Amended (re-transcribed 2007-08-07)" (PDF). Bureau of Land Management, U.S. Department of the Interior. Retrieved 2014-09-08. ^ Davis, Margaret L (2001). Dark Side of Fortune: Triumph and Scandal in the Life of Oil Tycoon Edward L. Doheny. University of California Press. p. 149. ^ a b Government sells scandalized Teapot Dome oilfield for $45 million, Denver Post, Associated Press, January 30, 2015. Retrieved 4 June 2017. ^ McCartney, Laton (2008). The Teapot Dome Scandal: How Big Oil Bought the Harding White House and Tried to Steal the Country. New York: Random House. ISBN 978-1-4000-6316-1. ^ MacDonald, Scott B.; Hughes, Jane E. (2015) [1st pub. 2007]. Separating Fools from Their Money: A History of American Financial Scandals. New Brunswick, N.J.: Transaction. ISBN 978-0-7658-0356-6. ^ a b O'Brien, Timothy L. (November 1, 2018). "Politics & Policy: Ryan Zinke and the Murky Interior of Trumpworld". Bloomberg News. Retrieved December 19, 2018. Even in a department with such a colorful history, the current secretary stands out for his plethora of ethical investigations. ^ Cria, Bryan (April 11, 2017). "Making the Teapot Dome Scandal Relevant Again! President Trump can learn from Harding's disaster". University of Virginia. Retrieved December 19, 2018. ^ a b Waxman, Olivia B. (December 17, 2018). "Where Embattled Interior Secretary Ryan Zinke's Resignation Fits in the History of Cabinet Scandals". Time. Retrieved December 18, 2018. ^ Krugman, Paul (June 7, 2018). "Corruption Hits the Small Time". The New York Times. ^ Watergate & the Teapot Dome Scandal: The History and Legacy of America’s Most Notorious Government Scandals (Kindle ed.). Charles River Editors. November 2, 2016. ASIN B01N9IMB2P. ^ Roberts, Chalmers M. (June 9, 1977). "Uncovering a Coverup on Teapot Dome". The Washington Post. ^ Nazaryan, Alexander (November 2, 2017). "Trump is Leading the Most Corrupt Administration in U.S. History, One of First-Class Kleptocrats". Newsweek. Retrieved December 20, 2018. ^ Tusk, Bradley (April 4, 2018). "Why Is Corruption So Common in the Trump Administration?". The Observer. Retrieved December 19, 2018. ^ Alvarez, Joshua (December 17, 2018). "Happy Trails, Ryan Zinke". Washington Monthly. Retrieved December 19, 2018. ^ Benen, Steve (October 24, 2017). "Private contracts for work in Puerto Rico raise eyebrows". Rachel Maddow Show. MSNBC. Retrieved December 19, 2018. Bates, J. Leonard. The Origins of Teapot Dome. Urbana, IL: University of Illinois Press, 1963. Bennett, Leslie E. "One Lesson From History: Appointment of Special Counsel and the Investigation of the Teapot Dome Scandal". Washington, D.C.: Brookings Institution, 1999. Ise, John. The United States Oil Policy. New Haven, CT: Yale University Press, 1926. Murphy, Blakely M. (ed.) Conservation of Oil and Gas: A Legal History. Chicago: Section of Mineral Law, American Bar Association, 1949. Noggle, Burl. Teapot Dome: Oil and Politics in the 1920s. Baton Rouge, LA: Louisiana State University Press, 1962. Werner, M. R. and Starr, John. Teapot Dome. New York: Viking Press, 1959. This page is based on the Wikipedia article Teapot Dome scandal; it is used under the Creative Commons Attribution-ShareAlike 3.0 Unported License (CC-BY-SA). You may redistribute it, verbatim or modified, providing that you comply with the terms of the CC-BY-SA.